Have you started to find it hard to hear conversations? Our ability to hear begins to decrease from the age of about 40, with most people experiencing significant hearing loss by 80. This starts with higher pitched sounds like children’s and women’s voices. You may also develop some hearing loss if you work or socialise in noisy environments like building sites and night clubs. If you’re finding it hard to hear things but don’t feel that you require a full hearing aid yet, the Wellys Mini Sound Zoomer ear amplifier is an excellent and discreet way to being fully experiencing the world around you again. In the beginning stages of hearing loss you may find it harder to separate the things you want to hear, like people’s voices, from background noise. 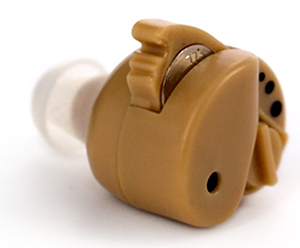 The Wellys Mini Hearing Amplifier filters sounds so that you can focus on the important things more clearly. The adjustable volume allows you to customise the level of sound enhancement to your needs. For example, it allows you to hear the television at a louder volume without bothering the people you’re watching it with. The Mini Sound Zoomer can be used indoors or outdoors and will increase sound levels for you by up to 20 decibels. It’s easy to maintain your Mini Sound Zoomer; just remove the silicone tip and wash it in warm, soapy water, then wipe the main unit with a soft, wet cloth.